Most people in the network marketing industry do not think like an entrepreneur nor do they know much about growing, building and running a SUCCESSFUL business (of any kind). I am not saying this to be judgmental, negative, derogatory, or to put people down. Most of the people in our industry are good, genuine people. They’re just not entrepreneurs. Instead, they’re employees or self-employed people. As a result, they think of their network marketing business as a part-time job, or an extra way to make money, but not as a real business. My goal today is to educate you about “the purpose of your network marketing business. I want to educate you so you have (1) realistic expectations, (2) you know why you are doing what you are doing, and (3) to help you begin with the end in mind. When you know what you should be working toward (and why), it makes the process much simpler and more bearable. Does that make sense? Most people join our industry to make IMMEDIATE money. They already have a full-time job and are looking for something on the side to supplement their income. They are accustomed to trading hours for dollars. Work forty hours in a week and get paid for forty hours worth of work. That’s how most employees get paid. In most cases, that’s the only mindset people in our industry have about making money. As a result, when they work part-time for one to three months in their network marketing business, and don’t make much money, they get frustrated and quit! What many of these folks don’t realize is that trading hours for dollars is NOT how businesses work. Business owners are only paid for results! No results, no pay! Business owners are building an asset, not trading hours for dollars. The purpose of starting a business is not to provide an immediate income. Instead, the real purpose of a business is to build an asset that provides you an ongoing income, whether you continue to work or not. Let me say that again so it hits home. The real purpose of a business is to build an asset that provides you an ongoing income, whether you continue to work or not. This is the ultimate goal of EVERY real entrepreneur. Build something once that will continue to pay you forever. Keep in mind, it might take you a few years (or longer) to build up any type of significant income (in any business), especially if you are doing it part-time! The second purpose of a business is to build up an asset that you can sell one day for a big payday. Not only can a business become an asset that provides you an ongoing income, but it’s also something with an asset value that you can sell. If you build up a successful network marketing business over a five to ten year period of time, you can cash out and sell it for a big payday (if you choose). Most companies in our industry let you do this. Let’s take a few minutes and expand on these two ideas. If you are just looking for a way just to make some extra cash TODAY, starting any kind of business probably isn’t the best way to do it. If you want extra cash TODAY, you should get a full-time or part-time job. Once again, most businesses take a couple years just to get profitable, and many never even survive to the two year point. Don’t believe me? Just drive through your home town and look at all the closed down businesses and vacant buildings. While a job will provide you with immediate income, the minute you stop working or lose your ability to work, your income stops. Job income is linear, not residual. 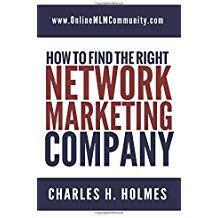 Not so with a network marketing business, and with some traditional businesses. If you build a business right, one with leverage through others, you can build up something that pays you for many years to come, even if you aren’t actively working in it. The more time and effort you put in on the front end to grow a real business, the less ongoing work is required on your part in the future. Money just keeps coming in. Yes, you have to do a few things to keep everything running seamless, but your effort gets a lot easier as time goes on. When it comes to selling your business, it’s a nice option to have. Maybe after five or ten years of building your network marketing business you decide to sell it for a large seven figure income and have your big payday. I’m not sure why anyone would do that, assuming they are making a large monthly residual income, but it’s still a nice option to have. For a long time, I thought like an employee. I really had no idea about how to think like an entrepreneur, let a lone a successful entrepreneur. When I first made the switch, I started to think like a self-employed person, not like a business owner. Trust me, there is a huge difference between a self-employed person and an entrepreneur, even if you don’t realize it now. I really challenge you to work on your thinking. The one book that really taught me how to think right was “The E-Myth Revisited” by Michael Gerber. This is hands down the best book I have ever read about the mindset of a successful business owner. I hope you will order a copy of it and study the information. It is completely life changing. You can order a copy of it here, or you can read my review here. The bottom line is you should think of your network marketing business as an asset, rather than a job or way to make an immediate income. Get a day job to pay your bills and keep the financial pressure off your back, and work on your network marketing business consistently, on a part-time basis, for three to ten years. Do that and you can build an asset that can potentially pay you much more than your full time job! Best of all, it’s residual income. Talk about a win-win deal. What are your thoughts? Do you think of your network marketing business as a job, or do you think of it as an asset? Leave a comment below and let me know what you think. I look forward to hearing from you. That was my ultimate goal- to build something that would offer myself and my family some stability financially whether we worked or not. As we discovered my son was having some health issues, the idea of getting paid just for hours worked seemed so tedious to me. I wanted something to work for me so I could dedicate myself to my son and his well-being. Once you get yourself out of that worker mentality you are better equipped to move into the field. The beauty of this industry is the residual income if you build it right. I agree Chuck. If a person goes in to the business with a mindset of not making any profit for a couple of years, it will make it much easier to accept. The whole idea is to build it into a strong asset. It does take work. No business just runs on its own, but as you said, as time passes by, it will get easier. In time, we have others doing most of the work for us. The lottery mindset that so many people have when joining a network marketing company is the biggest problem in the industry in my opinion. It is the idea that overnight money will come that makes people write and speak bad reviews. In most cases, it is because they were mislead. Thank you for making this post. I will share it. I can’t stand the lottery mindset that so many people in our industry have.